Beetles-drummers and Beetle the Candidate. British quartet The Beatles which can be approximately translated as the beetles-drummers, was returning to New York from a tour in Washington. A Pullman car carrying the artists was also filled with music critics, photographers and TV correspondents. During the train trip the artists were expected to discuss their views on music, culture and the meaning of life in general. The train started moving and the journalists got their notepads ready. Suddenly one of the artists, Ringo Starr yelled like a Tarzan and started jumping on the couches like an ape. John Lennon and George Harrison traded pants in public, the ones they were wearing at the time. Then Ringo made the buzzing noises sounding like a film camera, and George climbed on the luggage rack. Nevertheless, in only four weeks two and a half million records by the “beetles” were sold in the USA. In Glasgow, England the performance by the quartet was banned after three and a half thousand crazed youths started crashing chairs and walls following the example of the artists. The noise during the concerts is so loud that the artists can’t hear their own singing. This actually makes them happy. Just the opposite, when they can hear each other’s screams they feel that the concert was a failure. How can one explain the popularity of the quartet “The Beatles”? 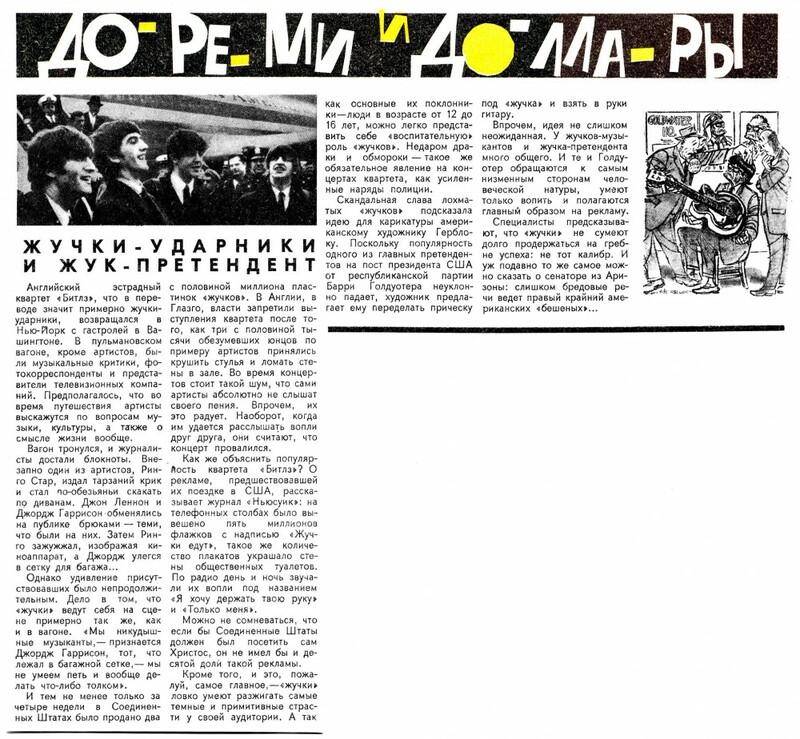 Even the magazine Newsweek mentions the ad campaign preceding their visit to the US: five million banners with the words “The Beatles are coming” were hanged on the telephone poles; the same number of posters was decorating public restrooms. Their screams named “I want hold your hand” and “Love me do” were played on the radio day and night. There is no doubt that if Christ himself visited the United States, he wouldn’t get even a tenth of the advertisement. Most importantly, “beetles” are masters at stirring up the darkest and the most primitive emotions in their audiences. And since most of their fans are between 12 and 16 years old, it’s easy to imagine the “educational” influences of the “beetles”. It only makes sense that fights and fainting are just as an inseparable part of the quartet’s concerts as the reinforced police presence. Scandalous fame of the hairy “beetles” gave an idea to an American cartoonist Herblock. Since the popularity of one of the leading candidates for the President of the USA from the Republican Party Barry Goldwater is steadily declining, the artist suggested he should a get a “beetle”-like haircut and pick up a guitar. Although this idea is not that outrageous; beetles – musicians and beetle-candidate have a lot in common. They both appeal to the lowest in human nature, they only know how to scream and mainly rely on the advertisement. **the article uses the wordplay Beatles-beetles mostly referring to The Beatles pejoratively as bugs.